Introducing our Fall 2018 Pantone-Inspired Color Collection of the Colorblock MOD statement earrings! Choose between all white or color blocked! 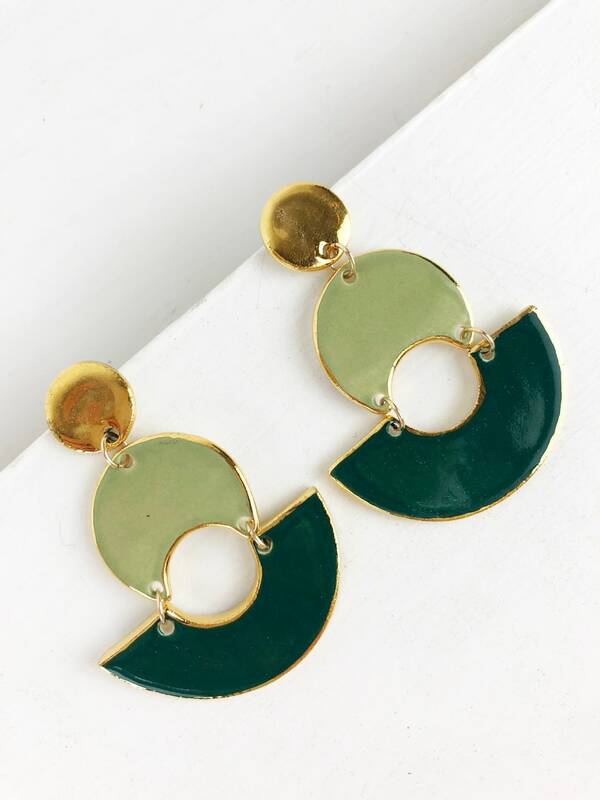 These oversize statement earrings are the perfect finale to your seasonal wardrobe! Sure to be noticed, and comfortable to wear! Light as a feather, we swear!! These handmade earrings are approximately 2.5" total.,1.5mm thick, and are glazed in high fire glaze. (The pendants are fired a third time with 22K gold luster over-glaze on the top.) Each earring is handmade from start to finish. The jump rings are 14/20 gold-filled. The posts are sterling silver and nickel-free. The backs are made of either sterling silver or white/clear rubber. - Pendants are fired three times, once for strength, another time to apply glaze, and a third time to apply 22K gold luster overglaze. Pendant & chain are lightweight for every day wear! - Jump ring, clasp are all 14/20 gold-filled. - Gift wrap in simple white box & colorful ribbon is available, please indicate whether you would like gift wrap at checkout. See pic for sample. -Each pendant will vary somewhat in color & finish as each are handmade. This sale does not include custom listings or special orders. Seriously gorgeous! Nicer than expected. Love! Love! Love! METHOD: I accept payment through Etsy, Etsy Gift cards, and PayPal. You're not required to have a PayPal account to pay for a purchase with PayPal. You may use direct checkout via Etsy. TERMS and DEADLINES: Immediate payment is required at ordering. Unpaid orders will be cancelled and re-listed unless we've made special arrangements prior to the sale. TAXES: 9% sales tax will be added to Alabama residents. If in the rare case your item arrives damaged, please report it to me within 48 hours of receipt. I will replace any item that was damaged during shipping. I do not give refunds for buyers remorse. If for some reason, you feel that the item you ordered was not what you expected, you may return it for a full refund, minus shipping charges. Please notify me upon the receipt of your piece and send it back to me for the refund. Please use the same materials your item came with and pack it with care so that the item comes back to me in good condition. Returning your item: We will be happy to send you a shipping label to return your item and we will be happy to refund you once the item is returned to us. I don't take any refunds on custom orders unless they are defective. Requests for refunds must be received via email: susanbdgordon [!at] gmail.com within 48 hours upon receipt of item. METHODS: I package all of my work with great care. I use recycled materials such as crate paper, bubble wrap, and styrofoam S's to help ensure your order arrives safely. I wrap each piece in bubble wrap and cushion it with the styrofoam S's or shredded white paper. GIFT WRAP: I am happy to provide complimentary gift wrap. I generally use white or brown paper wrapping, with a cream or pink colored ribbon. I also can enclose a gift card with a personal message from you. Leave a note in the "message to seller" and I'll be sure to include the message on your card. TIME TO SHIP: US retail purchased items are shipped out according to the time slated in your Etsy order receipt. Each item is shipped at a different rate; some will ship within 1 - 3 business days, others can take up to 4 weeks. Please read about ship times in the description of each item before purchasing. Once your item is ready, I will send you an automated etsy email with the estimated delivery date, shipping method, and tracking number. Please allow at least 24 hours for the tracking number to become live. COST OF SHIPPING: If you are local, and would like to pick your piece up instead of having it shipped, please contact me before purchasing and I will send you a code to use for free shipping. Unfortunately, the cost of packing and shipping pottery is high when it is packed correctly and with great care. I will almost always ship via USPS. UPGRADES: If you need something in a rush let me know and we can work out a rush order price and upgraded shipping. INSURANCE & CONFIRMATION: I personally deliver my packages to my local UPS or USPS store and make every effort to insure their safe and timely delivery. However, please understand that I can't be responsible for lost or stolen packages while in transit. I don't have any control once the package has left my hands. INTERNATIONAL DELIVERY: Please allow an estimated minimum of fourteen (14) days for the arrival of packages sent Internationally AFTER they have shipped. This is only an estimate and it can take longer depending on customs clearance times. Customs fee(s) and duties are the buyers responsibility. Custom's forms will be marked as "other" and the actual value of the item will be represented. Buyer assumes all responsibilities for items lost in the system and not delivered. USPS does not track packages for most countries once it reaches foreign borders. The package is the buyer's responsibility once it reaches their country's border. DELIVERY ADDRESS: Your item(s) will be sent to the address you provided with your PayPal or Etsy account or by using PayPal. Please be sure to verify this address is correct so you are able to receive your item. BRIDAL REGISTRY: I would love for you to register with me! Email me and let's get started! There are no returns on custom or monogrammed pieces. If for some reason you are unhappy or if we have made an error, we will most certainly try to amend our mistake. Buyers remorse does not merit a return. We do not offer free replacement for broken pottery once it has been delivered safely to you. Our stoneware is strong and durable but it is not unbreakable.